Weimar is a city with a rich history. There are some interesting places to visit in Weimar such as Bauhaus University, institution that teaches art and architecture, Stadtschloss (city palace) which currently serves as an art gallery Goethe and Schiller, Anna Amalia Bibliotek, a famous library with rococo style buildings. There are also Nationaltheater and Weimarhof Theatre for theater performances. 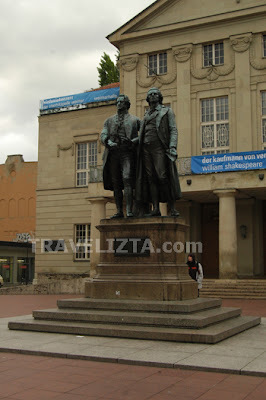 The famous Weimar statue is located at the center of it's square, Goethe and Schiller Memorial at Theaterplatz, a public open area that was established to commemorate the existence of Goethe and Schiller, two artists and public figures in Weimar. In addition to Schiller and Goethe statue in the square, there is also a brass statue of: "Carl August", a leader (Duke) of Weimar which placed on the front page of Ana Amalia Library. Ana Amalia is the mother of Carl August. The city is referred to as the warehouse of German artists. In addition to the historical buildings, Weimar is also known for having many beautiful parks, such as Park an der Ilm, a landscaped garden with an attractive arrangement with Goethe's summer house as the landmark. There was also "Bervedere garden", beautiful garden at the Summer Palace which has lots of trees. The park is located on the river bank area. A lot of places in Weimar is very suitable for reflection and contemplation area, quiet atmosphere, we could sit on the green grass while listening to the gurgling river and see the sights. We can see various culinary on café and restaurant is around Theaterplatz, like Thueringer Bratwurst (with big sausage), cakes and cake like Zupfkuchen, everything with low price (about 1 Euro). There is also: "Pizzeria da Antonio" just near by the square. "Divan doner a la turque" which is not far from Theaterplatz, who proclaimed himself as "The Number One Doner in Weimar" is also worth to try. They did not lie with the slogan, because the place is theone and only restaurant in town that sell "doner" in Weimar, delicious bread with large chunks of goat meat with a savory taste. 10 minute walk of Goethe House and Duchess Anna Amalia Library. Search for discounted hotels in Weimar Germany!